I wanted to write about Black Seed Oil, also known as Black Cumin Seed Oil, since it has been gaining in popularity, though it seems to have a vagueness that surrounds it as to what it actually does. Most articles on black seed oil seem to say that it’s “cures everything”, a claim that always makes me extremely skeptical since it brings to mind the unscrupulous snake oil salesmen of the last century. The more I looked into black seed oil, however, I found that there has been study after study done on its benefits, with great results. Research has found it to have beneficial effects on so many different aspects of health, including metabolic syndrome (a condition characterized by excess weight and high blood sugar), high blood pressure, high cholesterol, diabetes, respiratory health, skin conditions, and more. It’s impressive due to the sheer volume of studies that have been done that have shown benefit for so many vastly different things. Here’s a link to a review on Black Seed Oil studies. This is another review on the researched benefits of black cumin seeds. One of my favorite benefits for black seed oil is its effect on the immune system. One of black seed oil’s natural compounds is thymoquinone, a potent immune booster that strengthens and activates the immune system’s T-cells (the white blood cells that help to identify harmful invaders like bacteria and viruses). Research has shown black seed to have antibacterial and antiviral effects against a number of infectious diseases including strep and h. pylori bacteria and viruses like hepatitis and even HIV. That isn’t to say that black seed oil is necessarily a cure-all for those conditions, but that it has been found to have beneficial antibacterial and antiviral effects against those diseases. In addition to immune boosting effects, black seed oil has further benefits to the respiratory system itself, including being extremely helpful for asthma patients. In one study, people with asthma used black seed oil daily for three months and experienced impressive benefits in respiratory functioning and a reduction in asthma symptoms. The interesting thing about black seed oil is that it does not just seem to have immune boosting effects, but rather has shown to have an immune modulating activity- boosting the immune system when needed, but also helping to calm down the excessive immune response seen in autoimmune disorders like rheumatoid arthritis. One placebo controlled study on rheumatoid arthritis found that women who took black seed twice daily for a month found a reduction in their symptoms of RA. Black seed oil also appears to have protective effects for a number of the body’s different systems and organs, reducing destructive, toxic effects on the brain, liver, lungs cardiovascular system, and the digestive tract. This article has more in-depth information on the significant protection black seed has from toxic damage from a variety of sources (scroll down to about halfway through to read more about black seed oil’s beneficial protective effects). Black seed oil can also have beneficial effects on eczema and psoriasis and for those conditions can be taken both internally and used topically for relief. I feel like I’ve gone on and on already about the benefits of black seed oil, but in truth, there are so many more and I’ve only mentioned a few. Black seed oil has a long history of use for a variety of ailments. It is native to the Middle East and Africa, and has been mentioned in both the Old Testament and the Quran. The prophet Muhammad is even quoted as saying, “Use the Black Seed for indeed, it is a cure for all diseases except death.” Suffice it to say that it has a long history of impressive benefits and use- even back to the time of the Egyptians! 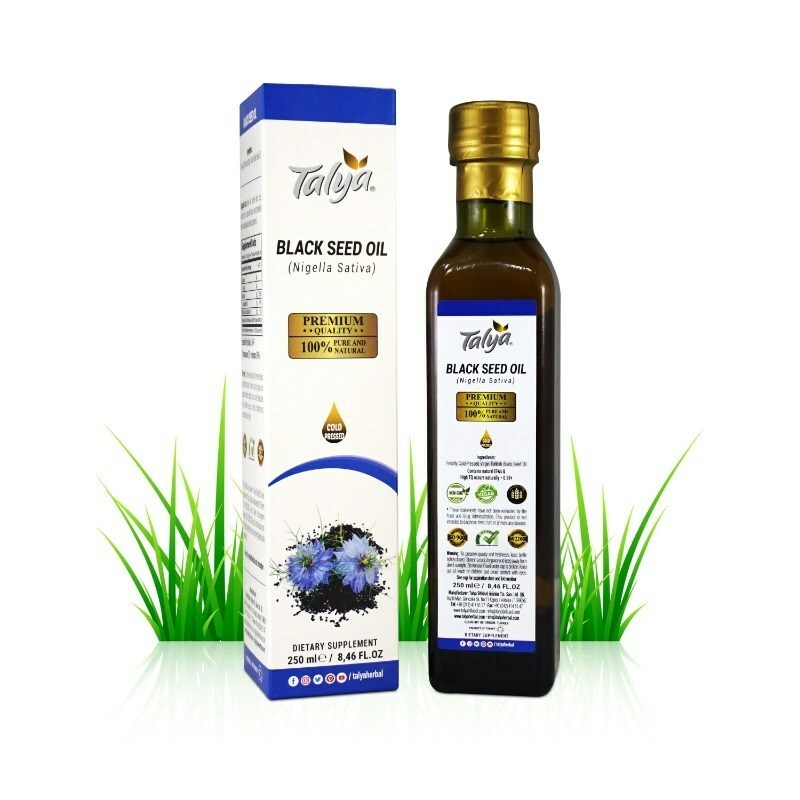 The black seed oil we recommend is by a company called Talya. As many of you know, we’re particular about the brands and products we carry. We chose this brand of black seed oil specifically since it has the highest amount of the beneficial active ingredients in black seed oil and is unrefined and cold pressed. Also, Talya does third party testing on each batch of black seed oil for potency and to make sure that it is free from pesticides, herbicides, as well as other chemicals and contaminants. Talya’s black seed oil meets France’s standards for “Eco Certification” and is in the process of undergoing organic certification processes by the USDA. The recommended dosages for black seed oil is one teaspoon twice daily for preventative health or two teaspoons twice daily, up to as much as six teaspoons a day (in divided doses) for acute needs or for recovering from an illness. Black seed oil should be taken with food to help absorption and it’s also important to shake the bottle vigorously before using it, since its beneficial compounds can separate when the bottle sits. We will have a representative in the store on Saturday, March 9th from 10-2 to offer samples of our Talya black seed oil and to offer further information. Be sure to stop by! Collagen supplements are something that have been around for a long time. They’re well known supplements that have many great uses with benefits for skin, joints, digestive health, and even bone health (which I will write about more in depth in this article). Other than bone broth and bone broth concentrates and powders, the reason why collagen supplements are generally taken in powders or chews is that you need to take a fair amount of it to make a real difference, and if taken as a pill or softgel, generally you would need to take a good handful to get the recommended amount (which is doable, but sometimes powders can be easier). We recommend bone broth especially when it comes to wanting to take a collagen supplement. There are two mail types of collagen (more on that below) and with supplements they will usually focus on one or the other. Both types have different benefits though most everyone would benefit from both, which is why bone broth is nice, since it contains a more complete collagen profile. We in particular recommend Jarrow’s Bone Broth Powder. It makes a delicious broth which can be very warming and comforting on a cold day (it’s available in both beef or chicken). 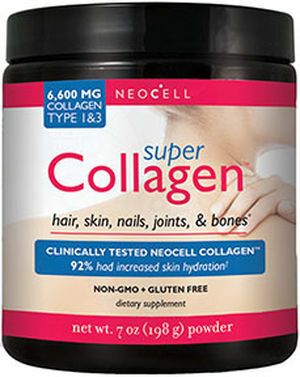 Another collagen powder supplement that we recommend is by NeoCell. It is a hydrolyzed collagen, which means the collagen has been broken up into smaller particles so it is easier for the body to absorb. The reason we most like NeoCell powders is that they are odorless and tasteless, so it can easily be added to foods or drinks without issue. Collagen is absolutely crucial for bone health. While our bones are made up of calcium crystals, they are held together in a bone collagen matrix. Collagen helps to make up our actual bone structure, and gives our bones flexibility and durability. When one thinks of “brittle bones” lack of collagen is a major factor contributing to that. Collagen helps to make the bones more stable and elastic. Interestingly, in addition to helping with joint flexibility (which is part of the way our bodies avoid fractures) type 1 collagen can actually help to stimulate osteoblast formation, cells that help to regulate passage of calcium into the bones. Type 1 collagen can also help to reduce the formation of cells that break down the bone matrix. Type 1 collagen is found in both skin and bones. While we can’t see our bones without a bone scan, we can see our skin. It’s easy to see the effects of collagen loss in our skin- as we age our skin becomes thinner with reduced elasticity and even becomes more fragile. Those can be outward signs of collagen loss, which affects our bones in similar ways that we cannot see, with our bones becoming more brittle and less flexible. There are different types of collagen (there are more than two types, though I am only focusing on the first two since they have the most benefit). Type 1 collagen is the kind most found in skin, tendons, and bones; while type 2 collagen is more present in bone cartilage and being beneficial to digestive health. Bone broth contains both kinds, being a whole food product, and we like going that route since the two types of collagen have different but wonderful benefits). We have a great bone broth powder concentrate by Jarrow available at the store, which is much more economical than buying liquid bone broth. We also have supplements of powders or chews which focus more on specific types of collagen with more specific benefits. Stop by the store so we can help you find the collagen products which are best for your specific needs. Hyaluronic acid is an amazing, but little-known supplement that is fantastic for both joint pain and aging skin. Hyaluronic acid is found throughout the body; its main function is to lubricate joints and muscles, but also helps to lubricate the skin as well. Many people begin taking hyaluronic acid for joint pain and find they have the happy “side effect” of a reduction of fine lines and wrinkles on the face. Hyaluronic acid is helpful for arthritis because it helps to plump up cartilage, giving it extra cushioning and shock absorption. Because it helps to bind water to joint tissues, it can help with reducing joint friction and pain. Hyaluronic acid is thought of as “nature’s moisturizer” since it works to plump up and lubricate the skin. Hyaluronic acid is effective when taken in pill form for both joint and skin health, but can also be applied topically since it penetrates the outer layers of skin easily, hydrating and restoring the dermal layers. The amounts of hyaluronic acid the body produces is drastically reduced as we age, so supplementing can definitely help with “turning back the clock” for both joints and skin. For the month of September, all of our Jarrow Hyaluronic Acid will be on sale for 25% off. We just got in a new after sun aloe gel by NOW Foods that I am in love with. Recommendation the first: don’t get sunburned. If you’re like me, however, and may have waited too long before reapplying your sunscreen when you were at the pool, this stuff is the best. It combines pure aloe gel, which everyone knows is great for sunburns, with a bit of cooling peppermint oil which soothes on contact, along with several healing and skin calming ingredients like cucumber, vitamin E, and B vitamins. Don’t forget to reapply your sunscreen every two hours (more frequently if you’re in the water). Sunburn prevention is best, but still, I am going to be bringing an extra bottle of this when I go on vacation next month! We have a new line of facial products that I wanted to feature by Andalou Naturals. What makes these different is that they are research-based products that use potent antioxidants and fruit stem cells to aid in cellular repair as well as significantly improving skin appearance and texture. While many people will use different skin products from different companies, I wanted to mention the benefits of using a complete line targeted to your skin type. The Andalou Naturals Skincare Lines I’ll mention below have each been in independently tested in a clinical testing which found over an 80% improvement in skin after using each of the skincare lines for 6 weeks. Each of the Andalou Naturals products are made to improve and complement each other, so using them in a layered fashion can make an impressive difference in your skin, since their products enhance the effectiveness of each other. The (Purple) Age Defying Line uses the antioxidant power of resveratrol and CoQ10 to increase cellular renewal and reduction in wrinkle depth. After 6 weeks, research found that participants experienced an 87% increase in skin elasticity. The (Orange) Brightening Line uses Vitamin C, Turmeric, and Sea Buckthorn to help to reduce hyper pigmentation from sun damage and acne scars and evens out skin tone. After 6 weeks, research found that participants experienced an 86% overall enhancement in skin tone and luminosity. The (Blue) Clarifying Line combined the calming and purifying ingredients of Willow Bark, Kombucha, and Cucumber to clear skin. After 6 weeks, research found that participants experienced an 83% overall improvement in their skin. The (Pink) 1000 Roses Line is made specifically for people with extremely sensitive skin. It’s formulated with rose stem cells and damask roses to soothe skin and increase skin’s resilience. After 6 weeks, participants with easily irritated skin experienced zero irritation. I wanted to highlight a new product line we’ve started carrying that I’ve been really impressed with. They’re argan oil facial treatments mixed with essential oils by Simplers Botanicals. If you haven’t heard of argan oil, it’s an amazing oil for skin that can actually improve skin’s appearance and texture. Argan oil can have a normalizing effect on the skin by balancing sebum production, which has benefits for dryness as well as oily skin. Argan oil can also help to prevent oxidative damage by combat environmental pollution and UV radiation. his is the blend for oily, combination, or overactive skin. It combines argan oil, which can help to improve the appearance of scars with grapefruit to help detoxify and decongest skin as well as vetiver essential oil, which further helps to balance overactive oil production. This is the blend for mature or sun damaged skin. It combines argan oil with evening primrose oil and tamanu oil to promote elasticity, and then essential oils of rose, lavender, rosemary, and helichrysum to improve the appearance of scars and imperfections and carrot seed to even out skin tone. This is the blend for dry, sensitive, or hyperreactive skin. It combines argan oil with Australian sandalwood and Moroccan blue chamomile essential oils to help calm hyperreactive and sensitive skin and blue cypress and palmarosa to aid in hydration and rejuvenation of skin. This blend can also be helpful for people with rosacea since it is so calming to the skin. Each of these blends are meticulously crafted with ingredients to make a real difference for a variety of skin types. Some people, particularly those with oily skin, are afraid to put oils on their face, but oils can actually reduce the skin’s proclivity to produce excess oil. For those with dry skin, healing skin oils are extremely nourishing. Skin treatment oils can be applied after washing the face as a natural moisturizer, or if you use other skin products and lotions, they can be applied in the following order: serums > lotions/creams > facial oils. Applying a facial oil after a lotion can actually help to seal in that moisturizer, resulting in extremely soft and supple skin.